The poetry of Dana Gioia. With the publication of "Can Poetry Matter?" 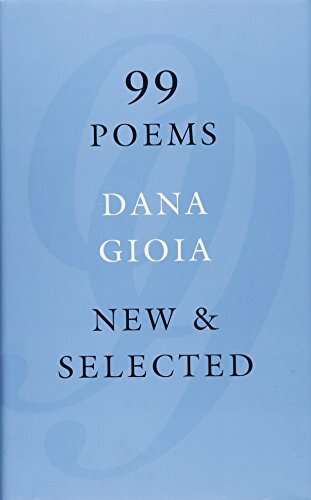 in 1991, Dana Gioia established himself as a provocative essayist and public intellectual, and his recent tenure as the chairman of the National Endowment for the Arts gave him an influential platform from which to promote his belief in poetry's importance. The publication of 99 Poems: New and Selected prompts us to remember, however, that poetry has always been Gioia's primary vocation, the craft from which his other efforts flow. In a culture obsessed with quantity and novelty, Gioia stands out for his commitment to quality. He has written four slim volumes of poetry in the past twenty years, and his new collection contains just fifteen previously uncollected poems. These 99 poems exhibit a remarkable range in both subject matter and form. Gioia is known as a New Formalist, a label that emphasizes a return to more traditional rhyme and meter. Many of his poems do draw on traditional forms, but he also writes in free verse and the only sestina in the volume pokes fun at "sestinas / written by youngsters in poetry workshops." In his own description of New Formalism, Gioia emphasizes its subject matter: "What the New Formalists … imagined was a new imaginative mode that took the materials of popular art—the accessible genres, the genuinely emotional subject matter, the irreverent humor, the narrative vitality, and the linguistic authenticity—and combined it with the precision, compression, and ambition of high art." Such material flits across the internet in a variety of forms, but it generally fails to receive the close attention and linguistic resources that poetry brings to bear. Gioia explores the aesthetic resources of poetry in more detail in the aptly titled poem "Words," which declares at its outset, "The world does not need words." This assertion of poetry's superfluity frees the art from a burden to create or sustain reality, a burden that it cannot bear. And yet, the poem contends, "the stones remain less real to those who cannot / name them / … To name is to know and remember." It is this task of naming—a task simple and profound, superfluous and vital—that poetry accomplishes. By naming mundane life with care, poetry draws attention to and celebrates the way the world overflows all referential demarcations: "The daylight needs no praise, and so we praise it always— / greater than ourselves and all the airy words we summon." If Gioia can bring such crafted language to bear on spheres of life often overlooked, he can encourage more people to avail themselves of the articulate, aesthetic powers of poetry. These powers are sorely needed in a culture characterized by a lack of care. Consumer culture rewards those who discard the old and seek the easy pleasures of a new purchase, a new place, a new relationship. Gioia charts these forms of restless desire in poems like "Shopping," which figures the mall as a pagan temple, and "Waiting in the Airport," a place shaped by our longing to be somewhere else. Rather than taking the time to attend to others in all their complexity, it is easier to experience the ephemeral rush that comes from choosing something new. As he writes in "Style,"
Most lives consist of choosing the wrong things. As if sheer mass bestowed integrity. In his 2007 commencement address at Stanford University, Gioia summarized Marcus Aurelius, urging the graduates "to trade easy pleasures for more complex and challenging ones." And in his poetry, Gioia celebrates the complex and challenging pleasures of care—care for language, for people, for places, for God. Poverty, Chastity, and Growing Grapes. The archbishop calls my port a miracle. an afterlife. That's not why I stay there. This is the life I didn't want to waste. His commits himself to monastic life not to gain a heavenly reward but to live his earthly life more fully. Like the port he makes, his life gains richness and flavor as it ferments within the limits of these vows. And the assonance of "Grapes," "Grace," "stay," and "waste" causes the vowels to roll like full-bodied wine over the reader's tongue as the poem draws to a close. The ghost in "Haunted" provokes the narrator to lead a more rooted life, and the ghostly voices in "A California Requiem" mourn the damage caused by their failure to do so. Gioia imagines walking through a cemetery and hearing earlier settlers of California speak to him from their graves: "Become the voice of our forgotten places. / Teach us the names of what we have destroyed." Without these names, they cannot seek absolution for their crimes: "We cannot ask forgiveness of the earth / For killing what we cannot even name." Words make our minds articulate and thus responsible to a complex reality, whereas displaced desire remains abstract and fails to cultivate the particularizing language of care. Wanting everything, he got nothing. Gioia, in a talk titled "Sense of Place," quotes this poem, concluding that "what we will not grasp, what we will not protect in the world around us, will be lost." As long as we covet the feeling of being in love more than we desire the good of the beloved, we will fail to name or care responsibly. Placing these poems so close together highlights the tension between their concluding lines and suggests that fidelity to a person or a place enables one to relinquish, to live and lose well. Without such fidelity, desire haunts us with "what-ifs that won't stay buried," but marriage enables us to cherish the beloved we know will be lost. Gioia's countercultural commitment to making art that orders and roots our restless desires likely flows from his Catholic faith. He argued for the renewal of Catholic art in a widely-read essay published by First Things, and in a recent interview he confided that "art without a metaphysical dimension still feels diminished to me." Gioia's assessment of Richard Wilbur seems to apply equally well to his own poetry: "Although Christianity provides the central vision of his work, he has written little devotional verse—overtly pious poetry, that is, that tries to replicate the act of worship. Instead, Wilbur characteristically uses the images, ideas, and ceremonies of the Christian faith to provide perspective on the secular world." This is precisely what Gioia's poetry does as it probes and critiques the frenetic restlessness of modern desire. In one of his more explicitly religious poems, "God Only Knows," Gioia speculates that perhaps "Bach's greatest work / was just an improvised / accompaniment" that "stopped the burghers / squirming in their pews," causing them to see a sky full of "angels / holding ledgers / for a roll call of the damned." Terrified that they would hear their names read from this roll, these suddenly-attentive burghers "sung / to save their souls." Like Bach's music, Gioia's poetry is sublime enough to hold the attention of even the most distractible readers. And once he has their attention, he teaches them to name and care for their places, their neighbors, and their eternal souls. Jeffrey Bilbro is assistant professor of English at Spring Arbor University. His book Loving God's Wildness: The Christian Roots of Ecological Ethics in American Literature was published in 2015 by University of Alabama Press.